The ZUIKO DIGITAL ED 14-35mm f2.0 SWD joins the existing ZUIKO DIGITAL 35-100mm f2.0 as the brightest fixed aperture lenses in their class. Moreover, a new ultra-compact, high-performance ZUIKO DIGITAL EC-20 2x Teleconverter doubles the focal lengths of any lens attached from the wide selection of FourThirds and Olympus E-System lenses, for twice the telephoto power. Now the ZUIKO DIGITAL ED 50-200mm f2.8-3.5 SWD (which covers a zoom range equivalent to 100mm to 400mm on a 35mm camera lens), combined with the EC-20, will provide a huge equivalent zoom range of 200-800mm. All three SWD lenses will be manufactured at the Olympus Tatsuno Plant in Japan, which is equipped with the highest state-of-the-art production technology in the field of optical equipment. Olympus-proprietary SWD technology has enabled an ultra-fast, whisper-quiet, high-precision AF system. Two compact, high-powered SWD devices power autofocus at an ultra-high speed by exciting unique elliptical oscillations, while an ultra-compact 5.3mm x 4.3mm optical encoder detects and controls the lens drive position using direct rotation detection without reduction gear. This enables it to achieve a level of precision that’s accurate to 5 microns (5/1000 mm). When used in combination with the new E-3, which offers improved AF computation and lens-body communication rates, the SWD motors provide the fastest focusing speed of approximately 170 ms (0.17 seconds). The ZUIKO DIGITAL ED 12-60mm f2.8-4.0 SWD is a high-performance standard zoom lens, which covers a zoom range equivalent to 24mm to 120mm on a 35mm camera lens. Special optical glass elements are used to correct various types of aberrations, while the 100 percent digital design ensures high-definition performance with clear, crisp images from edge to edge. This lens also boasts impressive close-up shooting capability, allowing users to shoot from as close as 25cm throughout the zoom range. 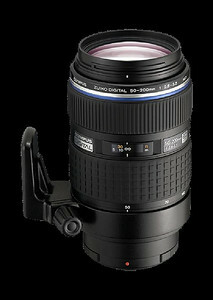 The lens’ autofocus is powered by Olympus’ breakthrough SWD. Designed to be the world’s fastest AF system, this extraordinary autofocus drive provides both high speed and high precision while operating with lower noise than ever. Optimized for use with the new E-3, this lens enables the camera to demonstrate the full power of its high-speed capability, providing the fastest autofocus available in the world using a standard zoom lens. The ZUIKO DIGITAL ED 50-200mm f2.8-3.5 SWD is a high-performance super-telescopic zoom lens that features, for the first time, the SWD (Supersonic Wave Drive) autofocus system and covers a zoom range equivalent to 100mm to 400mm of a 35mm camera lens. ED lens elements are used extensively to correct the color blurring that can occur when telescopic lenses are extended to their maximum focal length, while the digital-dedicated design ensures high-definition performance with clear, crisp images from edge to edge. Close-up shooting capability is also superb, with a minimum shooting distance of just 1.2 meters throughout the zoom range. Autofocus is powered by Olympus’ breakthrough SWD, enabling this lens to achieve an AF speed about two times faster2 than the previous ED 50-200mm f2.8-3.5 model. The ideal partner for the E-3, this lens maximizes that camera’s high-speed autofocus capability, and with its superior tracking capability, this lens is ideal for sports photography and outdoor shooting applications. The ZUIKO DIGITAL ED 14-35mm f2.0 SWD, which covers a zoom range equivalent to 28mm to 70mm on a 35mm camera lens is the world’s first standard zoom lens to feature a large f2.0 aperture3. Boasting industry-leading imaging performance, this lens is a worthy addition to the Olympus Super High Grade (SHG) series of lenses. Together with the ED 7-14mm f4.0, ED 35-100mm f2.0 and ED 90-250mm f2.8 lenses, this lens completes Olympus’ series of professional zoom lenses with fixed F-values. The flagship of the ZUIKO DIGITAL series, this lens was developed to meet the requirements of the most demanding professionals. It includes reliable splash- and dust-proofing, Olympus’ exclusive SWD-driven ultra-fast AF system, a mechanically interlocked manual focusing mechanism and a large, petal-shaped hood with a polarization filter control window. With its unique f2.0 aperture providing bright viewing with a sharp subject and a soft blurring of the background, this lens epitomizes the versatility, power and creative freedom made possible by the Four Thirds System and is ideal for almost any application – from landscapes and portraits to indoor shooting and photojournalism. The ZUIKO DIGITAL 2x Teleconverter EC-20 is an ultra-compact, high-performance lens capable of doubling the focal length of the master lens. It can be mounted on any ZUIKO DIGITAL lens, dramatically extending lens performance and putting more subjects within the photographer’s range without affecting mobility or ease of use. Complementing the already available ZUIKO DIGITAL 1.4x Teleconverter EC-14, the EC-20 adds new versatility to the ZUIKO DIGITAL line-up, providing a convenient, cost-effective solution to the demands of telescopic shooting, as well as wide-angle macro and ultra-high-magnification shooting. 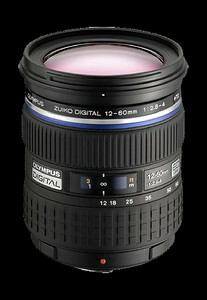 The ZUIKO DIGITAL ED 12-60mm f2.8-4.0 SWD will be available in November 2007. 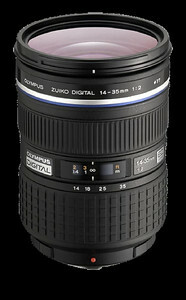 The ZUIKO DIGITAL ED 14-35mm f2.0 SWD will be available in the first quarter of 2008. The ZUIKO DIGITAL 2x Teleconverter EC-20 will be available in December 2007. For more information, review units and high-resolution images of the new Olympus lenses contact Michael Bourne, Mullen Public Relations, 978-468-8953 or michael.bourne@mullen.com, or Jennifer Lyons, public relations manager, Olympus Imaging America Inc., 3500 Corporate Parkway, Center Valley, PA 18034, ph: (484) 896-5350 / (800) 622-6372 or the Olympus Web Site: http://www.olympusamerica.com.